These Terms and Conditions apply to the provision of the services detailed in our quotation to you. You are deemed to have accepted these Terms and Conditions when you accept our quotation or at the start of the works (whichever happens earliest) These Terms and Conditions and our quotation then become the contract and agreement between us. Additional costs will be incurred in addition to the quotation should further works or upgrades be requested by yourself during the works. A business day means days excluding Saturday, Sunday and Bank Holidays in England and Wales. The heading of Terms and Conditions are for ease only and do not affect their interpretation. We will take reasonable care and skill in our performance of the works which comply with the quotation, including any specification in all material respects. We can make changes to the quotations which are necessary to comply with any applicable laws or safety requirements. We will notify you should this become applicable. We will use reasonable endeavours to complete the works within a reasonable timescale. We will do all we can to avoid delays, however there may be times where this is unavoidable. Unforeseen works that are encountered i.e. under floor boards or in the roof that are not discovered during quotation or visual inspection may change the cost of the works. We will advise upon discovery of any cost implications. These Terms and Conditions apply to the supply of any goods as well as services unless we specify otherwise. You must obtain any relevant permissions, consents, licences or otherwise that we need and must give us access to all relevant information, materials, properties and any other matters which we need to complete the works. This includes availability of keys. If you do not comply, we can terminate services. We are not liable for any delay or failure to provide our service if caused by your obligations. Quotations are valid for 3 months, either party can withdraw for any reason prior to your acceptance of the quotation and booking in of works. You must give notification of cancellation of any booked in works 1 full working day prior, this includes site visits, or else call out charges up to 10 % of the quoted works may apply. If, due to circumstances beyond our control we must make changes in our services or how they are provided, we will notify you immediately. We will use reasonable endeavours to keep such changes to a minimum. Payment is required upon completion of works, unless a separate prior agreement is in place. Payment can be made by bank transfer to: AMS Electrical Barclays Bank PLC, S/C: 20-94-74 ACCT: 73024121. 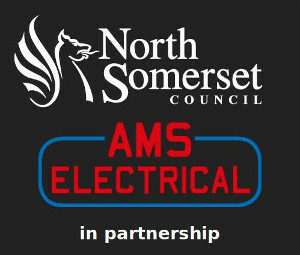 Alternatively, telephone payment can be made by calling the AMS Electrical office: 01934 520116 before 2pm. Cash and cheques are no longer accepted-on works quoted after 1​st​ October 2017. Should payment not be received in line with the payment terms you will receive a reminder before formal (internal) ‘Outstanding Payment’ procedures are instigated. This could escalate to the involvement of a 3​rd​ party Debt Collection Service. All reasonable costs of recovering a debt may be passed on to you. If you are a business and payment becomes overdue (clause 17) interest and fees in line with the Commercial Debts Regulations Act 2013 will be added. This would be a maximum amount of 8% plus the bank of england base rate. Should works be large enough to warrant multiple invoices over a period, if any payment is late (outside of your agreed terms) we may pause or terminate work until payment is received.